Get ready to celebrate EATOPIA - Food Court and More - the city's first multi cuisine food court is now open at Habitat World. A utopia for food lovers... Eatopia five express food counters offer a never before choice of cuisine from across the globe, under one roof in a trendy and fun ambience. And more... a happening cyber cafe, funky video games and a play area for children complete a world-class food court experience. 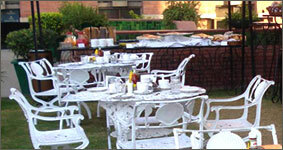 Open to both non-members and members of IHC, Eatopia provides the much awaited relaxation and eating option to the occupants of thirty-six institutions that are housed within India Habitat Centre, as well as to the delegates of various international and other conferences held at Habitat World daily. The Great American Meal Experience is here! 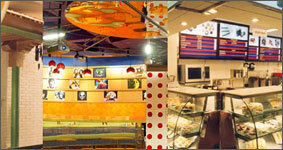 Habitat World at IHC is now home to India's first diner- 'THE ALL AMERICAN DINER'. One of America's most recognised icons, 'The Diner' was born when Walter Scott began to offer prepared food from a converted horse-drawn freight wagon in Providence, Rhode Island in 1872. His lunch wagon was an immediate success and others copied and improved on his concept. These pioneers helped create an industry that would eventually produce thousands of diners. Open to both non-members and members of the IHC, The All American Diner is also the second much awaited relaxation and eating facility after Eatopia, for the occupants of thirty-six institutions that are housed within the IHC complex, delegates of various international and other conferences held at Habitat World daily and visitors to the many cultural programmes and exhibitions, for whom using the 'members only' restaurants is not an option.